Located in the heart of the Green Mountains of Central Vermont in the quaint town of Mendon, is The Vermont Inn, a 1800’s country inn on five acres. Ask us about The Vermont Inn or share your Vermont visit comments. To feature your business, contact us. The Vermont Inn – Aerial view of this popular Vermont Inn and Restaurant. 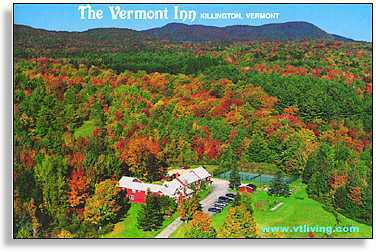 The Vermont Inn is a charming country inn located on five acres in the Green Mountains of Vermont. The Vermont Inn is now owned and operated by Mitchell and Jennifer Duffy offering the charm of a family run inn with excellent New England and Continental cuisine. The Vermont Inn has achieved a three diamond rating from AAA and the Vermont Inn restaurant has won the Killington Champagne Dine Around Award for fine dining for three consecutive years. Vermont Living Magazine congratulates Jennifer and Mitchell Duffy and encourages you to visit The Vermont Inn in Killington, Vermont.